Besides being great for helping you digest big meals, basil tea also helps relieve headaches and prevent stress from wreaking havoc on your body. Try it! 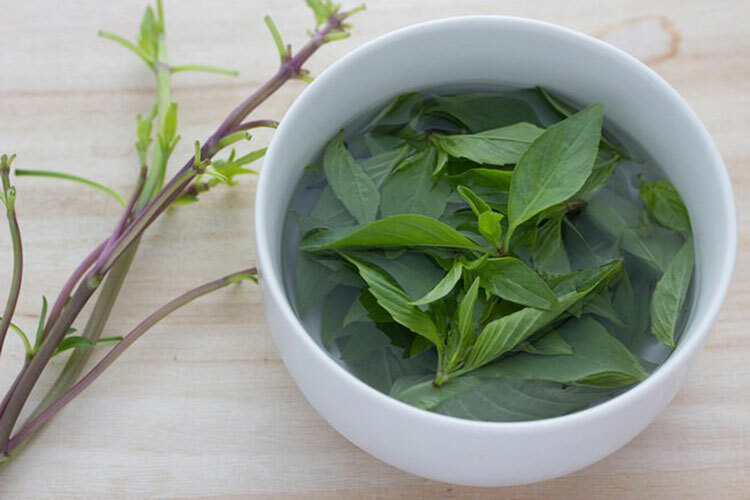 Basil is a fragrant medicinal plant that has been used for hundreds of years for its applications in the kitchen as well as in alternative medicine. It belongs to the Labiaceae family and has oval-shaped leaves and bunched white or rose-colored flowers that appear in the summer. Basil possesses some great healing powers due to its antibacterial and anti-inflammatory compounds. In addition, it can even prevent muscle spasms. It’s high in essential oils, antioxidants, and other nutrients, making it great for your health in many ways. However, some people don’t know about its wonderful powers and have no idea how good it is for their health. Since basil tea is one of the best ways to take advantage of it, we’d like to highlight 8 reasons to drink it every day. Basil is remarkably good for your respiratory system. The antibacterial, detoxifying, and anti-inflammatory abilities of basil help it to clean your respiratory airways. This removes toxins that tend to cause illness. It also has an expectorant effect. It helps get rid of phlegm in order to relieve symptoms of bronchitis and asthma. In addition, since it improves your immune system, it’s an effective solution for a cold or the flu. The diuretic effect of this tea is ideal for supporting kidney function. This is especially the case when many fluids and toxins are in your kidney tissues. Basil’s anti-inflammatory effect helps your kidneys do their job properly, preventing infection and kidney failure. In addition, its antioxidants create a protective barrier to keep oxidative damage and toxins away, thus reducing the risk of kidney stones and chronic illnesses. As if that weren’t enough, it increases urine production. This helps eliminate bacteria that grows in your urinary tract. Natural basil extracts that come from drinking it in tea form act as an anti-stress agent that relaxes you physically as well as mentally within minutes. Consuming it in small quantities helps stop excessive production of cortisol, the stress hormone. Instead, it increases your secretion of positive endorphins. Since it inhibits oxidative stress, it’s also great for optimizing performance. The anti-microbial compounds in basil tea create a protective barrier against germs that cause oral infections and disease. They deep-clean your mouth and help get rid of food residue that lets bacteria multiply. It’s even a home remedy for bad breath and gingivitis. It neutralizes halitosis and reduces inflammation. Basil tea is an effective solution for tension headaches that keep you from going about your day. Its anti-inflammatory and calming properties help optimize cellular oxygenation and improve circulation. This happens with drinking the tea as well as with applying hot compresses of basil tea. Due to its high flavonoid and tanin content, basil tea is excellent at preventing premature cell aging. These substances, together with its essential oils, protect tissues from the breakdown that free radicals cause. This also helps prevent serious diseases. At the same time, it’s great for your skin, as it protects it from wrinkles and spots that come with age. Basil is good for your digestion and can help control stomach pain, excess gas, and inflammation. Consuming its tea feeds healthy intestinal bacteria and helps get waste moving. It’s a great remedy for indigestion from heavy meals, since it regulates stomach pH and stops excessive production of stomach acids. Having this tea every day is a way of supporting proper balance in your body’s inflammatory processes, especially if you have an injury or arthritis. Basil decreases inflammation, stimulates the removal of built-up fluids, and helps with pain. Are you ready for a cup of basil tea? Get some fresh basil from the market and make this tea every day to enjoy all of its many benefits!